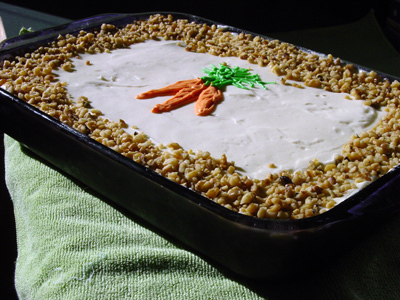 Look, it’s good carrot cake. Moist, thanks to the buttermilk glaze. Tender. Flavorful. The frosting is to. die. for. But the cake itself? Meh. I think my issue with it is that its only spice is cinnamon and, in my ideal carrot cake, there’s more going on. It kind of reminds me of an oatmeal cookie, which is fine for oatmeal cookies, but I want a little more out of my carrot cake. Having said that, I brought it to a pot luck and complete strangers came up to me and raved about it. So … I don’t know. It’s not my favorite — and back to the drawing board! Grease and flour a 9×13-inch pan and preheat oven to 350-degrees F.
Stir together flour, baking soda, cinnamon and salt. Beat eggs and sugar, oil, buttermilk and vanilla at medium speed with an electric mixer until smooth. Add flour mixture, stirring until blended. 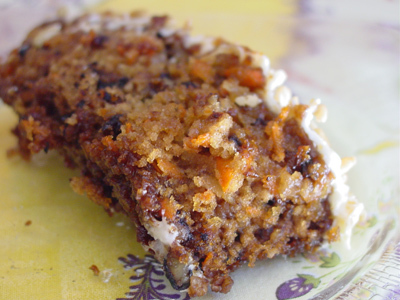 Fold in carrots, pineapple, coconut, and pecans. Pour batter into pan and bake for 30 minutes; cover pan loosely with aluminum foil to prevent excessive browning, and bake 13 more minutes or until a wooden pick inserted into center comes out clean. Drizzle Buttermilk Glaze evenly over cake; cool completely in pan. Spread Cream Cheese Frosting evenly over cake. Bring first 5 ingredients to a boil in a saucepan over medium to medium-high heat. Boil, stirring often, for 4 minutes. Remove from heat, and stir in vanilla.